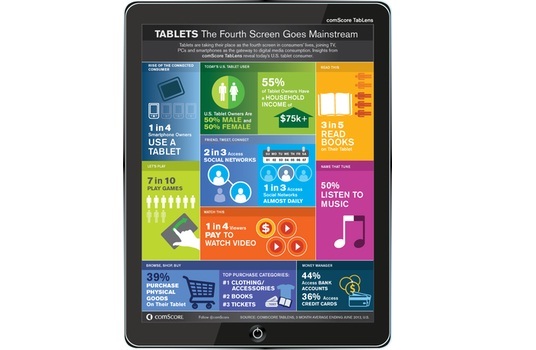 ComScore recently announced the launch of ComScore TabLens, a monthly, 3 month rolling survey of over 6,000 US tablet owners. The survey had a number of interesting findings, but in my opinion the two most important were tablet purchase consideration factors and income demographics of tablet owners. These are probably the most useful inputs when it comes to projecting the state of the tablet market in the coming years. 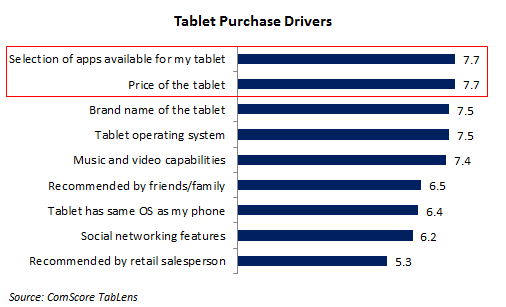 Unsurprisingly, the two most important tablet purchase drivers were app selection and pricing. Within tablet buyers, iPad owners were more brand-conscious, while Android tablet & Kindle Fire owners were more price-sensitive (which is driven by income demographics, shown in the chart below). These purchase drivers explain the dominance of the iPad and the early success of smaller tablets like the Kindle Fire and Nexus 7. However, this also hints that the Microsoft Surface and other Windows 8 tablets could struggle in the market. Comparing income demographics of tablet owners with smartphone owners is useful because smartphones are already mainstream products while tablets are still getting there. The income demographics of smartphone owners show what tablet ownership could be like once tablets are completely mainstream. 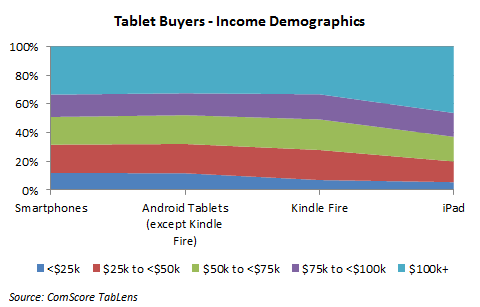 As we can see from the chart above, income demographics of Android tablets and the Kindle Fire buyers are very similar to that of smartphone owners. However, more than 45% of iPad buyers are from the $100k+ income group, which is vastly different from the smartphone segment. This means that as the market continues to mature and expand, new tablet buyers would continue to shift towards lower priced Android tablets, the Kindle Fire and possibly the iPad Mini. Conclusion - The findings of ComScore's tablet survey show that the tablet market will continue to move towards lower priced options, as long as the app selection is large. 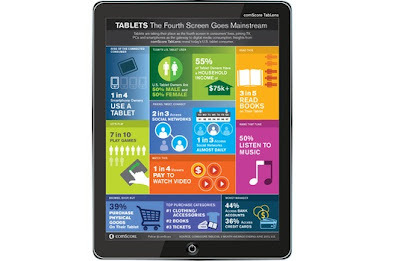 This is great news for manufacturers of certain smaller tablets, but bad news for the Microsoft Surface & Windows 8 OEMs.